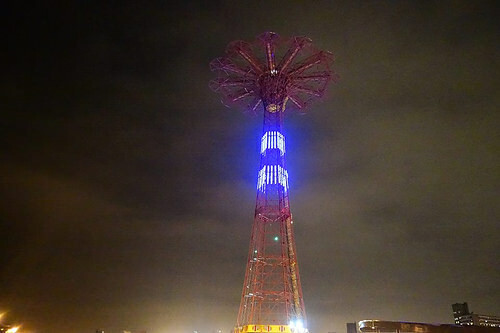 On Sunday night, the Parachute Jump lights went dark except for two blue stripes honoring the Brooklyn police officers who were ambushed and killed in Bedford-Stuyvesant on Saturday. The tribute in light to the NYPD’s Wenjian Liu and Rafael Ramos will be repeated on Monday. 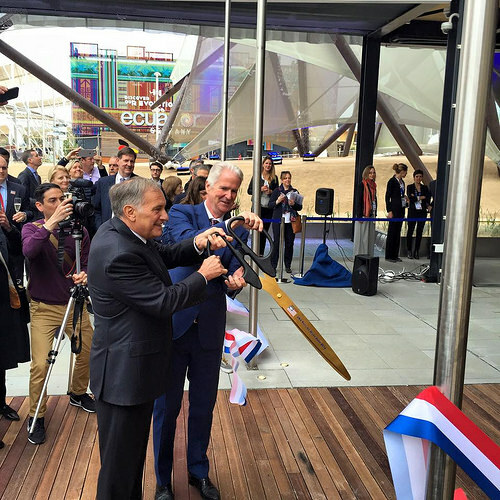 “Two nights in honor of the two officers,” said Councilman Mark Treyger, who represents Coney Island as well as Gravesend, where Officer Liu lived. 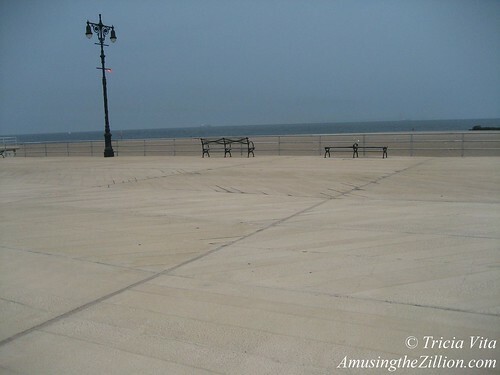 Treyger announced the lighting via twitter just before 6pm and later posted photos calling it a “soaring tribute” and thanking “all of our finest for your courage & sacrifice.” Approximately 300 people attended the candlelight vigil and prayers at the Parachute Jump, said Coney Island photographer Bruce Handy. 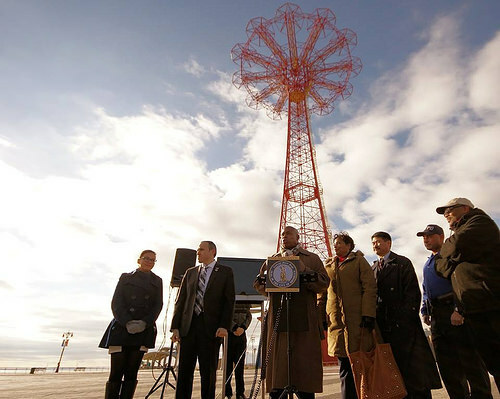 In attendance were City Council members Treyger and Chaim Deutsch, Brooklyn Borough President Eric Adams, clergy, and community officials and residents, as well as members of the NYPD, FDNY and EMS from South Brooklyn. 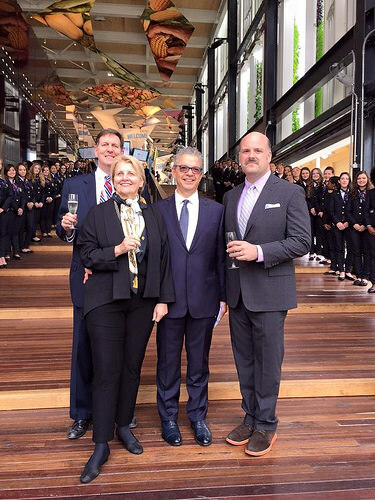 The Parachute Jump, which is lit year-round by Luna Park with 8,000 LEDs, went gold on September 5th as part of the Gold World Project to raise awareness for Childhood Cancer. On New Year’s Eve, the Jump’s LEDs will ring in 2015 with a simulated “ball drop” and light show. 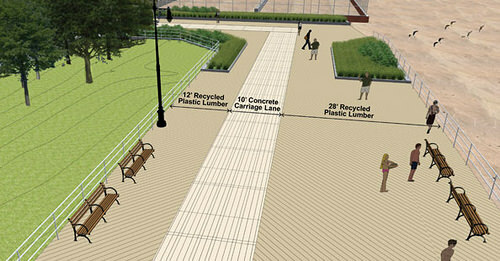 For friends of the Boardwalk, “Landmark the Boardwalk!” is a new rallying cry to go along with “Boardwalk Not Sidewalk!” thanks to City Councilman Mark Treyger. 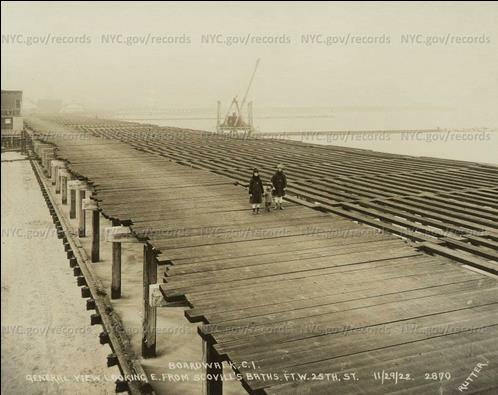 The council member for Coney Island and Bensonhurt told the New York Daily News that he sent a letter to the City’s Landmarks Preservation Commission to propose the boardwalk be designated a scenic landmark. 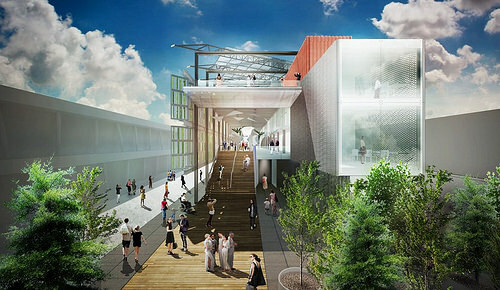 “Historically, it’s been a boardwalk, not a sidewalk,” said Treyger, a former high school history teacher who has proven to be a champion of the community in the Council. 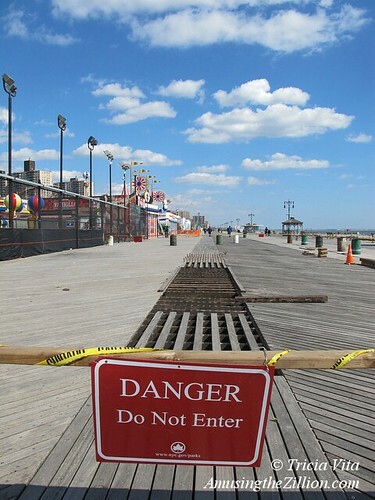 Getting the boardwalk on the LPC’s calender could stop the Parks Department from redoing portions of it with concrete and plastic wood, a process already underway in Sea Gate and Brighton Beach. 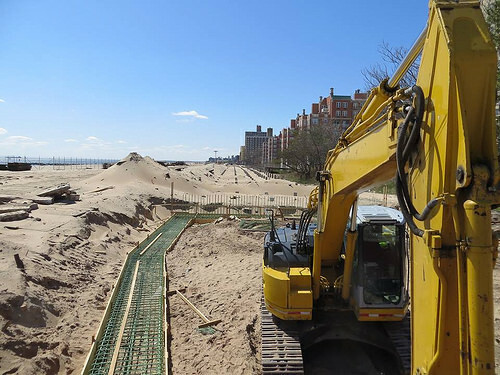 In March of 2012, a ten-foot-wide Concrete Lane for so-called “emergency vehicles” and an adjoining Plasticwalk were unanimously approved by the Public Design Commission for a pilot project in Brighton Beach. 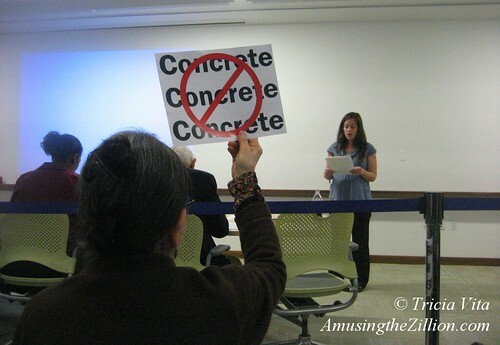 At the charade of a public hearing, public testimony was cut to 2 minutes per person and six commissioners appointed by Mayor Bloomberg got to decide the future of the Boardwalk for the people of New York. 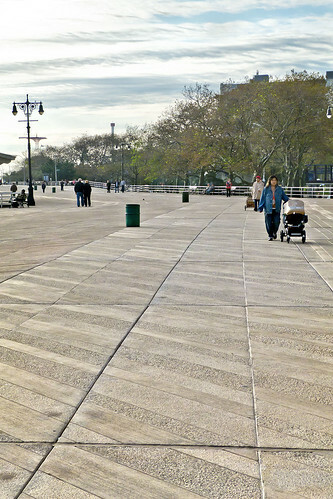 One of the public comments at the hearing was that the Boardwalk should be renamed the Public Design Commission Concretewalk because it will no longer be the Riegelmann Boardwalk. 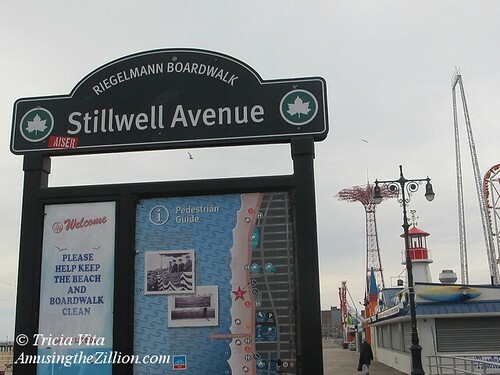 As Borough President of Brooklyn, Edward Riegelmann took charge of building the Boardwalk, which opened in 1923, making it just a few years younger than the landmark Wonder Wheel. 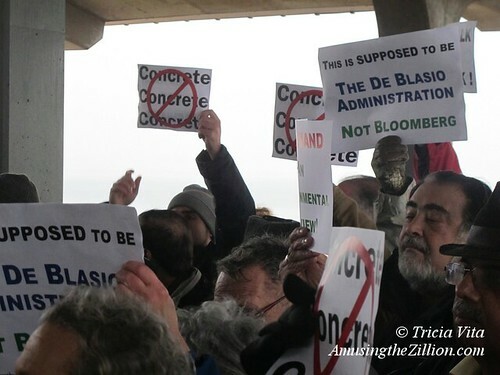 We’ve been very disappointed with Mayor de Blasio’s decision to carry on with Mayor Bloomberg’s Coney Island Concretewalk despite letters from newly elected local councilmen Mark Treyger and Chaim Deutsch asking for a moratorium until further environmental studies could be done. 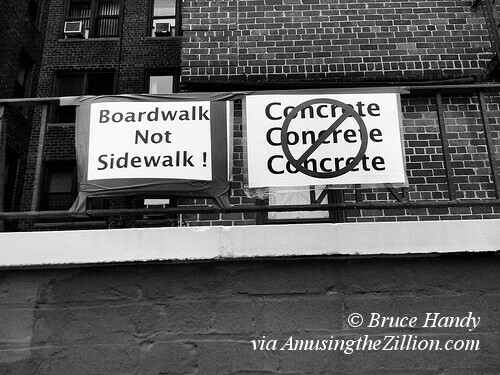 Last June, Daniel Zarrilli, head of the Office of Recovery and Resiliency, a holdover from the Bloomberg administration, told the City Council: “The use of concrete in boardwalks is not going to change at this point, is a sound decision and that stands,” according to the Daily News. 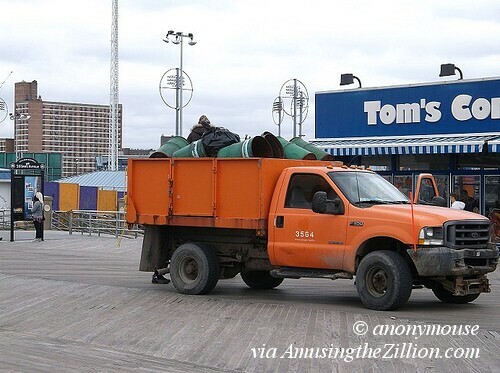 Ironically, the news was released on the eve of the Mermaid Parade, where the mayor and his wife marched on the Boardwalk not Sidewalk with their son and daughter, who were King and Queen of the Mermaid Parade. 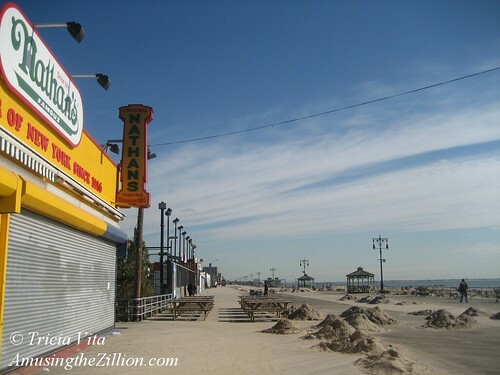 Send a message to Bill de Blasio urging him to support the landmarking of the Coney Island Boardwalk. 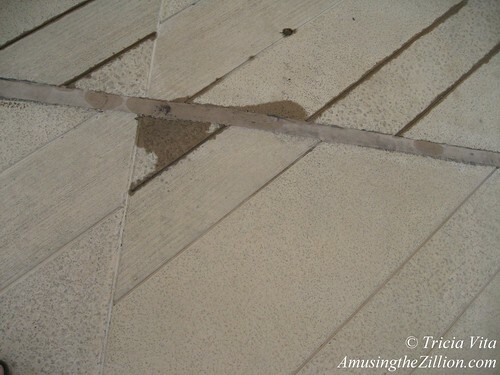 Here is a link to an online form to contact the Mayor. 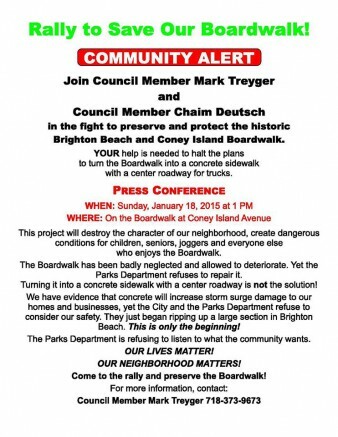 City Council members Mark Treyger and Chaim Deutsch, whose districts include the Coney Island-Brighton Beach Boardwalk, have just launched a public petition calling for the Landmarks Preservation Commission to designate the boardwalk a “Scenic Landmark.” Please help their efforts by signing this petition at Change.org and sharing it with your friends. 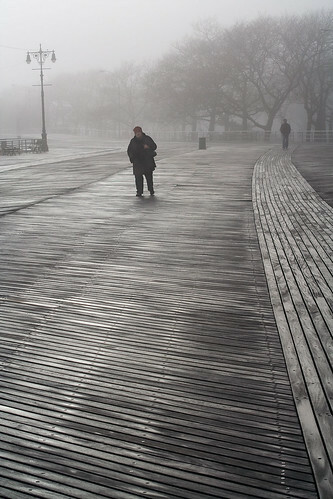 It could be our last chance to stop the Boardwalk from becoming the Concretewalk.